Ive been watching lots of Primark Haul videos and personally enjoy them. It seems everyone finds something different in their store, I do find the store a little overwhelming at first but then often start at one end and work my way around in a horse shoe style. So onto the goodies, I have a nice variety of patterns and styles! So first on my list was a Maxi Skirt and thankfully I managed to get the last size 12 in Navy. These are meat to be worn up high on your waist, I find this style very flattering. I like the little tan belt and will keep this one with it. Next up I found these Leopard Print Ankle Grazer trousers. They're a soft ice cream mint with a sweet link glitter belt. I'm not too keen on the belt so not sure whether to keep it with the jeans or try a different colour? They have little gold zips up the side and a gold button to do them up. So maybe a gold metallic belt would work better? These where £12 reduced to £6! I wanted a plain black top to wear with these, and my god was that a hard task! You would think a black plain top would be easy to find but it wasn't. However after a through rummage I found this loose fitting jersey style top. It has a pretty sheer pattern on it, I would wear a black best underneath. These were big for their sizes so picked up an 8. This was £6. Following with the Tribal/Aztec trend I picked up this body con printed skirt. It's such a lovely mix of colours and print, I plain on teaming this up with the black top mentioned above. This skirt was £4!! 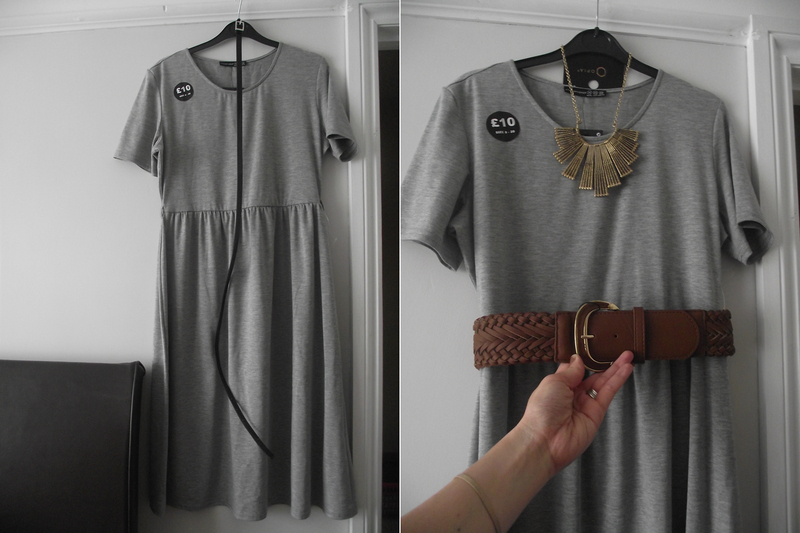 Next I picked up the popular grey Marl t-shirt dress. I love the length of this, Ive seen this on many blogs and it's always looked so nice so I thought I would give it a whirl. When I tried it on I did feel a little 'frumpy' however once I took the thin black belt away and replaced it with a chunky tan belt it soon started looking more wearable for myself. It was priced £10 which is a steal but when i checked my receipt it went through at £5!!!!!!!!!!!!! I picked up a chunky necklace to wear with it but can't make my mind up? I may take it back, what do you think? Keep or return? Then I had to pick up some plain best tops to wear underneath loose fitting/ sheer tops. Whilst making my way to the till I saw these mega cheap sandals which where on sale for £1.90! Lastly I picked up 2 packets of the gold metallic false nails, these look amazing on! I first saw them when watching Holly's & Anne's YouTube video and wanted them! I've heard the glue isn't great so I'm going to buy some Nailene glue and use that. These packs where £1 each, they had lots of other designs. Have you picked up any bargains from Primark lately? you should keep the necklace, enjoy! What a gorgeous haul! I have to say I'm massively impressed at how nicely you keep your clothes- mine end up crumpled and creased within a minute of being hung up ha-ha! The maxi is just beautiful! I wanted that grey dress, but they didn't have my size. Sobs. The worst of it is, that I picked it up and put it back down on another trip :( hopefully I'll get it one day. I bought that necklace a few weeks ago, I love it! I've wore it with a little black dress on a night out, worked perfected to glam my look up. Love the aztec skirt. I haven't been into primark in YONKS! Must make a trip. Wowzers thanks ladies, I'm glad this has been a popular post and you've all enjoyed it. I love a good Primark haul post. I'm cutting back and am getting jealous of all these posts!